Anthem needs to see Congress make several short-term fixes to stabilize the Affordable Care Act's exchanges before it decides on the extent of its participation in 2018. Joseph Swedish, the Indianapolis-based insurer's CEO, told investors Wednesday that “we need certainty” that measures will be put in place to keep the individual market afloat and keep people insured as the new administration works to dismantle and replace former President Barack Obama's signature healthcare law. “If we can't see stability going into 2018 with respect to either pricing, product or the overall rules of engagement, then we will being making some very conscious decisions with respect to extracting ourselves,” Swedish said. Anthem's hesitation is shared by other insurers. While the industry's leadership hopes Washington will shore up the individual insurance market that covers nearly 20 million Americans, they can't commit to selling exchange plans or set 2018 prices in the individual market—due in the spring—until they have an inkling of what the future holds for the health insurance landscape. So far, the Trump administration has yet to coalesce behind a comprehensive ACA replacement plan. It's unclear if insurers will get the details they need by their rate-filing deadline this spring. Until then, insurers are stuck. While they're good at managing risk, they aren't well-equipped to handle uncertainty, Erin Trish, a health policy professor at the University of Southern California, told Modern Healthcare in December. It's a tough sell to convince insurers, many of whom are losing money on the exchanges, to stick around if there's no sign that marketplaces will become profitable, she said. Anthem's a major fixture in the marketplaces. At the end of last year, 839,000 people in 14 states were covered through Anthem exchange plans. If it drastically scaled back its footprint, hundreds of thousands of members could be forced to find a new insurer. Choice and competition on the exchanges would further deteriorate, leading to higher premiums for enrollees. Leadership at national insurer Aetna, which pulled out of exchanges in 11 states this year, expressed similar concerns on Tuesday. Aetna now sells marketplace plans in just four states. CEO Mark Bertolini said it had no intention of re-entering those exchanges in 2018, citing the mounting uncertainty in the market. Insurers are asking for a few fixes to ensure plans are affordable and the risk pool is balanced. Anthem's Swedish called for repealing the health insurance tax and extending transitional health plans indefinitely; tightening up the special enrollment periods; requiring enrollees to pay outstanding premiums after premium grace periods before enrolling in new coverage; and keeping changes finalized in December to the ACA's permanent risk-adjustment program, which transfers money from insurers with lower-cost enrollees to companies that have higher-cost enrollees. Insurers have complained that the risk-adjustment program is heavily flawed, requiring some smaller, regional health plans to make big payments they can't afford. Insurers are also urging Congress to maintain certain policies during the transition period to a replacement plan, such as the individual mandate and the cost-sharing subsidies that help low-income people afford the exchange plans. Congress has shown a willingness to address some of these issues. Earlier this week, House Republicans introduced four bills meant to stabilize the individual insurance market while they repeal and replace the ACA. The bills address some of the issues that insurers say have made the exchanges an unprofitable business for them. Anthem's Swedish made his remarks during a call with investors to discuss the insurer's fourth-quarter earnings. The insurer, which is still waiting to hear if it will be allowed to merge with rival insurer Cigna, recorded revenue of $21.7 billion in the fourth quarter of 2017, up 7.6% over the same period in 2015. Revenue growth was driven by higher premiums and membership gains in Medicaid and self-funded employer groups. Its full year 2016 revenue totaled $84.9 billion, a 7.2% increase year over year. A decision on the $54 billion Cigna deal could come down any day. Most observers give the merger little chance of going through because Anthem and Cigna compete head-to-head for business from large employers. Moreover, the tie-up between Aetna and Humana, which was given a greater chance of closing, was blocked in a federal court last month. Anthem's membership grew 3.4% from the same time in 2015 to 39.9 million health insurance members at the end of 2016. Medicaid membership grew the most, adding 613,000 members during the year—a 10.4% jump. Anthem also added 706,000 members during the year through national employer accounts and local, self-funded businesses. 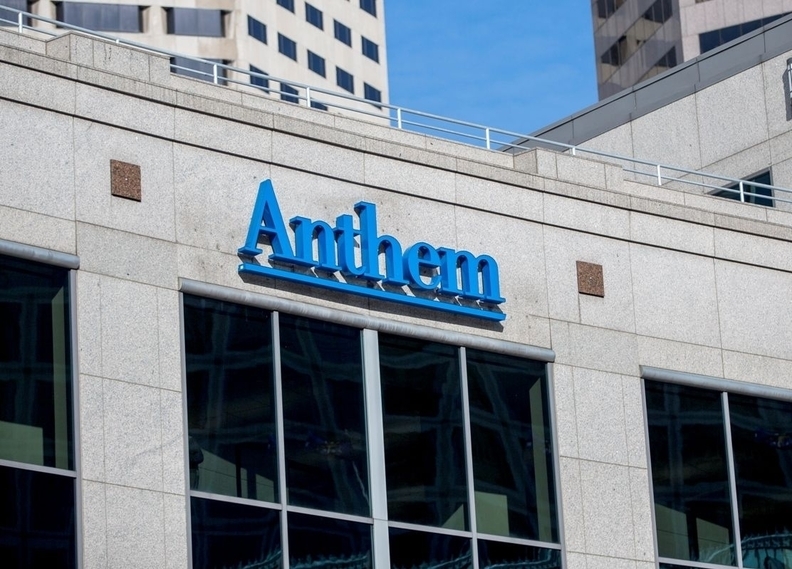 That membership growth, combined with lower medical costs in the local group businesses and Medicare, helped double Anthem's profit to $368.4 million compared with $180.9 million in the fourth quarter of 2015. Last year, Anthem's bottom line took a beating, plummeting 64% in the fourth quarter of 2015 compared with the prior year, because of high medical costs from sicker-than-average members enrolled through the ACA exchanges. The insurer is still experiencing those pressures. Its medical-loss ratio, which shows how much of the collected health insurance premiums are spent on medical claims, was 87.2% in the fourth quarter compared with 87% at the same time a year ago. Anthem pointed to higher medical costs, particularly from individual market and Medicaid members. Those issues, plus millions in costs related to the Cigna transaction, caused the insurer's yearly profit to dip 3.5% over 2015 to $2.5 billion.